This article was meant primarily as a tool for active News Media Reporters who needed a quick (yet well documented) source of information on the subject of Governmental Censorship as it relates to Medical Cannabis. As such this (1947) study, which was openly published and never actually under the threat of censorship, would normally not qualify for inclusion. The demonstration of anticonvulsant activity of the tetrahydrocannabinol (THC) congeners by laboratory tests (Loewe and Goodman, Federation Proc. 6:352, 1947 ) prompted clinical trial in five institutionalized epileptic children. All of them had severe symptomatic grand ma1 epilepsy with mental retardation; three had cerebral palsy in addition. Electroencephalographic tracings were grossly abnormal in the entire group; three had focal seizure activity. Their attacks had been inadequately controlled on 0.13 gm. Of phenobarbital daily, combined with 0.3 gm. of Dilantin per day in two of the patients, and in a third, with 0.2 gm. Of Mesantoin daily. Two isomeric 3 (1,2-dimethyl heptyl) homologs of THC were tested, Numbers 122 and 125A, with ataxia potencies fifty and eight times, respectively, that of natural marijuana principles. Number 122 was given to two patients for three weeks and to three patients for seven weeks. Three responded at least as well as to previous therapy; the fourth became almost completely and the fifth entirely seizure free. One patient, transferred to 125A after three weeks, had prompt exacerbation of seizures during the ensuing four weeks, despite dosages up to 4 mg. daily. The second patient transferred to 125A was adequately controlled on this dosage, except for a brief period of paranoid behavior three and a half weeks later; similar episodes had occurred prior to cannabinol therapy. Other psychic disturbances or toxic reactions were not manifested during the periods of treatment. Blood counts were normal. The cannabinols herein reported deserve further trial in non-institutionalized epileptics. Reprinted from Federation Proceedings, Federation of American Society for Experimental Biology, vol. 8, lY49, p. 284. The below newspaper article, taken from the “Salt Lake City telegram [May 20, 1947], was located via the National Archives (College Park, MD). It belonged to and was integrated into the files of Harry Anslinger’s old Bureau of Narcotics, today known as the D.E.A. We believe that it was the first that Anslinger knew about the study, and thus too late to CENSOR or put a stop to it. Drug principles isolated from leaves of marijuana, an innocent-looking plant that grows wild in different parts of the world, are playing an important role in research on a cure for epilepsy. This is the same marijuana which so many people fear as a habit-forming drug and which is noted for the opium-like dreams it produces in those who partake of it. The drugs being used are synthetic substances related to cannabinol, which is contained in marijuana, but does not produce the same effects. Dr. Jean P. Davis, faculty researcher at the University of Utah medical college, has done considerable research with the drugs in treatment of minor and convulsive epilepsy. Helps Minor Seizures One of these new drugs, trimethadione, is most effective in petit mal epilepsy, minor seizures common in younger patients. Another, paramethadione, a sort of second cousin to the first, is useful in such spells. A third compound, called phenerone, is effective in psycho-motor seizures, sudden episodes of unusual behavior, accompanied by amnesia. Epilepsy comes in four degrees: grand mal, or pykno-epilepsy, with brief staring spells; psycho-motor, accompanied by amnesia and unusual behavior, and Jacksonian, identified by retention of consciousness with progressive twitching and numbness of one leg or arm. Mr. Davis is in charge of a section of the psychiatric clinic at Salt Lake General hospital, where she does some clinical work. She also instructs advanced courses in the departments of pharmacology and physiology at the university. Began in 1929 According to Dr. Davis, actual valuable research with modern methods of fighting epilepsy came into their own in 1929 with the invention of the electro-encephalograph, an instrument for recording brain activity. And the latest of the compounds used in treatment of the affliction was developed in 1948. Meanwhile, research is advancing at a rapid pace, Dr. Davis said. She studied for three years under Dr. William Lennox, one of the top U.S. experts on epilepsy. She received her doctor of medicine degree at Yale university in 1943. With respect to the above — note that a Medical Cannabis like “synthetic substance” is being referred to. Try as we might, the museum has been unable to find the original letter written by Harry Anslinger to his field agents, expressing his concerns and ordering an investigation into the matter. However we have been able to locate the following (see below) internal letter from the Bureau. 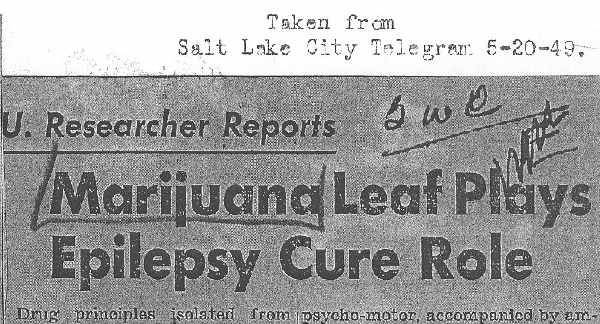 Reference is made to your letter of June 16, 1949 regarding the work of Dr. Jean P. Davis of the University of Utah Medical College on the use of marihuana is curing epilepsy, which was mentioned in an article taken from the Salt Lake city Telegram. Dr. Davis was interviewed and furnished me with twenty copies of her report, as you requested, and these are attached hereto. 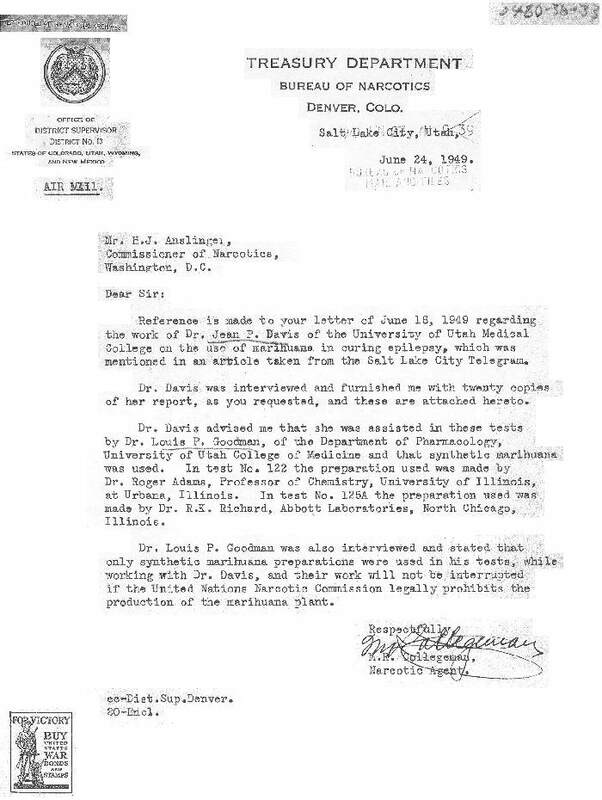 Dr. Davis advised me that she was assisted in these tests by Dr. Louis P. Goodman, of the Department of Pharmacology, University of Utah College of Medicine and that synthetic marihuana was used. In test No. 122 the preparation used was made by Dr. Roger Adams, Professor of Chemistry, University of Illinois, at Urbana, Illinois. In test No. 125A the preparation used was made by Dr. R.K. Richard, Abbott Laboratories, North Chicago, Illinois. Dr. Louis P. Goodman was also interviewed and stated that only synthetic marihuana preparations were used in his tests, while working with Dr. Davis, and their work will not be interrupted in the United Nations Narcotic commission legally prohibits the production of the marihuana plant. With reference to that Medical Study on Cannabis, despite the fact that we at the Bureau are doing everything to deny licensing and permits to do such research. Somehow this one slipped through the cracks and we just found out about a short time ago via a newspaper article. As per your instructions and sparing no expense to the taxpayer, we immediately rushed there to talk with the studies authors. Enclosed are some copies of the actual study. Damn it, there is more than one doctor involved in this, as well as a whole University Medical College – That means we wouldn’t be able to just launch a ridicule campaign to discredit her. Too many others involved. However, I got some good news, they didn’t use actual Medical Cannabis but some synthetic stuff. Hurray, we’re off the hook! — The stuff they were using came from two sources (1) A chemist at Urbana University and (2) Abbott Labs. Both of which will play ball with us. Talked to a few others over here and don’t worry, this won’t effect our plans to OUTLAW all growth of Cannabis – either for Medical or Industrial purposes. Nice people, now let’s look more into this “synthetic stuff” and where it came from? One source being Professor Roger Adams (a very well known chemist and Cannabis researcher at that time), via the University of Illinois at Urbana. The other being Abbott lab’s (Dr. R.K. Richard) a well known Pharmaceutical Company at the time. With reference to Abbott Lab’s, repeated letters of inquire with regards to their Cannabis heritage have ALL been met with a good case of amnesia. Boy do they have A-M-N-E-S-I-A, but as they are a private corporation, one guesses that they are well within their rights. However, below is an interesting letter that the reader might take note of; — Note the date, which corresponds to the dates of the ‘epilepsy study’. 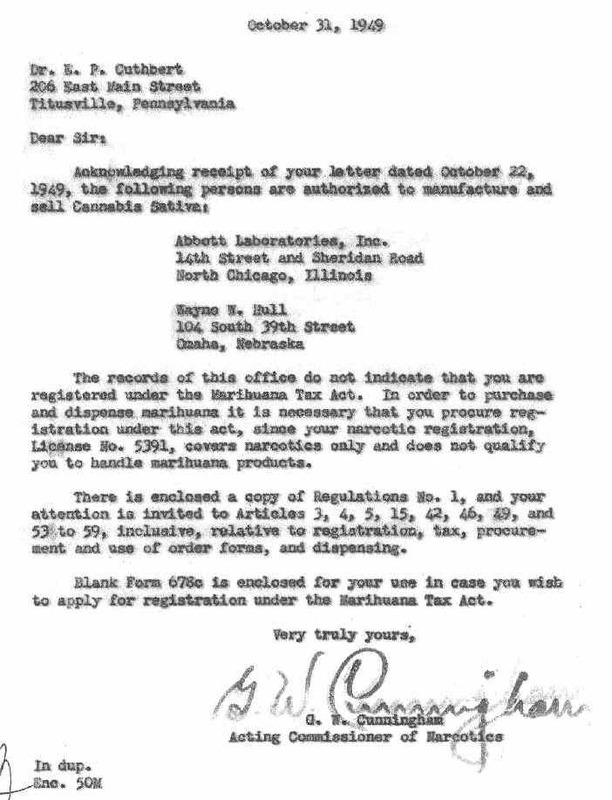 [From the Bureau of Narcotics – Courtesy National Archives, College Park, MD] [Lettered Doctored for quicker download time] NOTE: This letter was written in reply to a doctor requesting information on where to obtain Medical Cannabis. The records of this office do not indicate that you are registered under the Marihuana Tax Act. In order to purchase and dispense marihuana it is necessary that you procure registration under this act, since your narcotic registration, License No. 5391, covers narcotics only and does not qualify you to handle marihuana products. There is enclosed a copy of Regulations No. 1, and your attention is invited to Articles 3, 4, 5, 15, 42, 46, 49, and 53 to 59, inclusive, relative to registration, tax, procurement and use of order forms, and dispensing. Blank Form 678c is enclosed for your use in case you wish to apply for registration under the Marihuana Tax Act. Fortunately for us, the other source “Professor Roger Adams of the University of Illinois at Urbana, was a bit more forth coming. He wrote numerous articles on the subject of Medical Cannabis – many regard him as a legend in early Cannabis research. We also conclude that the drug in use was NOT actual Cannabis the plant, but a form of synthetic Cannabis homologs  that was developed by Mr. Adams, shortly before the study. This substance was tested along side Tetrahydrocannabinol (THC) and was found to be chemically similar in effect. Thus we can’t say that actual Cannabis was used in the study, but the experimental drug was very similar. However, this does not alter Harry Anslingers interest in the study, and also raises the following question – Why Would The D.E.A., Care One Way Or Another, About A Medical Study? What was their interest? [dealing with the subject of Medical research] . . . Harry, had a special desk with a well-respected chemist to take care of such requests. Anyway, that chemist knew what Anslinger wanted and always found some scientific reason to deny incoming Federal permit requests for medical research — if it had anything to do with Cannabis. . . . Which explains Anslinger’s anxiety and the Bureau’s special interest in this study in particular. Because this one made use of artificial Cannabis, from two sources that were already licensed under the Marihuana Tax Act by the Bureau. This one seems to have slipped right through the cracks — thus the reason (in this museum’s opinion) for the special interest from the Bureau.
. . . The narc’s have a very long history of repressing / ignoring the truth. . . . There are numerous other ways the narc’s have of assuring that Cannabis NEVER gets FDA approval. HOW? Which is a nice way of [saying] — NO WAY IS IT EVER GOING TO BE RE-LEGALIZED. However, as this study was conducted in 1947 (and as pure THC was not isolated until 1964), we must use a different definition. That being, a resinous substance extracted from the flowering tops of the female Hemp plant, picked just before pollination. Or in other words, Tetrahydrocannabinol can be thought of as just being another word for Cannabis the plant. – HOMOLOGS – WARNING, no one over here is a chemist, as such we just think of this word as being akin to – an inferior chemical (made in a lab) imitation of a naturally occurring substance. Or something that’s around 85% chemically (just like) but not quite. Thus when someone says, THC-homologs, they mean a synthetic substance or version of the real thing that’s not quite as good. — The quotation is not a word for word quotation, so as not to be sued under the copyright laws, but in context is ok.
 - The narc’s did give out permits to do Safety research on Cannabis, but it is a historic fact that they never allowed for any kind of FDA approval type of research to be done — NO WAY.